This Foot Elevator's octagonal design maintains space between heel and bed, preventing skin break-down. Dense polyurethane foam resists bottoming out. Adjustable plantar strap secures the foot, maintaining proper foot position. Permanently attached fasteners are guaranteed not to fall off. Latex free. Perfect for those at risk for pressure sores. 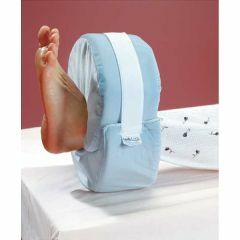 By raising the foot completely off the bed, this spiral-cut, polyurethane foam ring helps the skin heal. A washable flannel liner provides comfort around the ankle. The use of a pillow under the knee can help prevent hyperextension. A footboard may be used to prevent foot drop. Machine wash, air dry. Available in 4" or 6" (10 or 15cm) widths. My husband has an open wound on his ankle and this is the only thing that made sleeping bearable. It kept his ankle off the bed and away from the linens so nothing was rubbing up against it to irritate it and cause pain. I have already ordered a second one to be used in case the 1st one is lost or misplaced.